If you “like” Life Your Way on Facebook, you might have already seen this picture. But I love it so much that I had to share again! 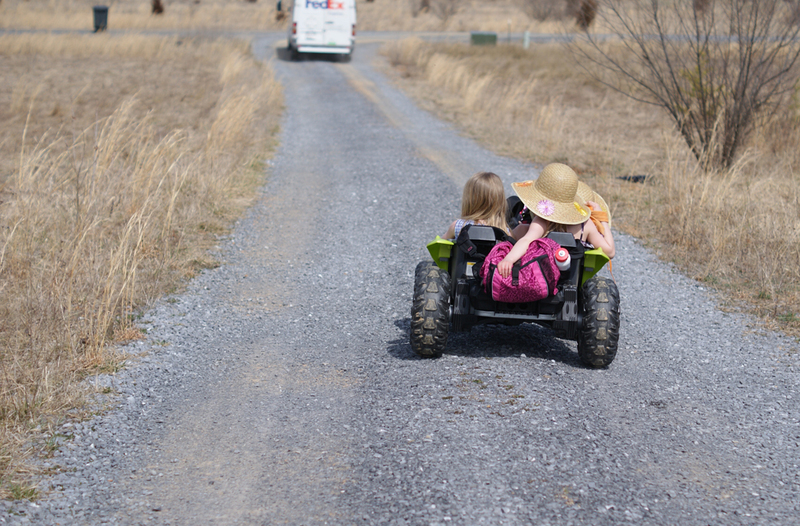 I was cracking up one afternoon this week as the three big girls filled their backpacks, donned their sun hats (from a luau party we had a few years ago) and hopped on the Dune Racer for a trip to the end of our road. They looked so tiny and so grown up — all at the same time — and as several friends said to me, it’s a picture of our future. And one I will always treasure! Don’t forget to pick up your Daily Planner from Invite.l, on sale for Life Your Way readers for just $17 shipped! Next week I’m co-hosting a chat at The Motherhood on 3/19 at 1 pm EST. Care.com has put together an amazing panel to answer all of your questions about summer planning. Hope to see you there! Are you raising me to DO good? Not just BE good? | Toddler Approved!